"Easy casserole, very rich with the butter and mushroom soup, but delicious!" In a large saucepan bring 8 cups water to a boil. Add rice and stir. Reduce heat, cover and simmer for 20 minutes. Meanwhile, in a small saucepan over medium heat, melt butter and saute green onions. Stir in soup. Combine soup mixture with cooked rice and stir in mushrooms and almonds; mix well. Spoon half of the mixture into a 1 1/2 quart casserole dish. Sprinkle half of the cheese over the mixture, then repeat the layers. Bake in preheated oven for 20 minutes, or until cheese is melted. See how to make the ultimate one-dish broccoli and rice casserole. I also cut the rice by 2 cups dry and added chicken boullion to the rice as it cooked. This way there's no need to add butter or a much smaller amt. if one chooses to. 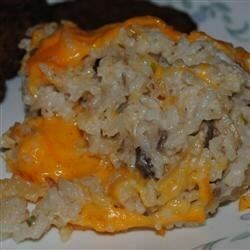 This recipe came out very good when I only added about 1 1/2 cups of rice and I also added mushrooms. Really good pot-luck dish. The almonds are a pleasant surprise to first-timers. Pretty good, was kind of dry though. Did not save well for leftovers.